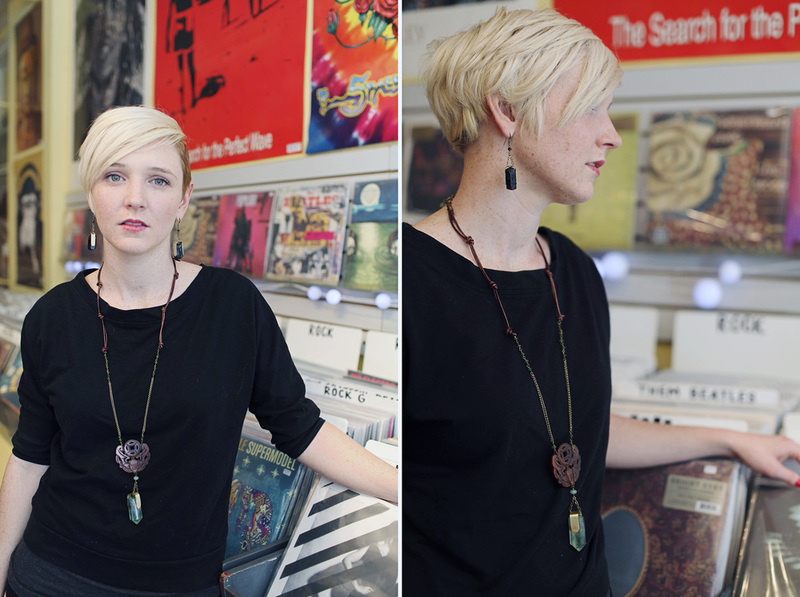 Carly and I joined artist and jeweler Jill Shropshire of ObscurO Jewlery at Deep Groove Records in March for a short but creative photoshoot to promote Jill’s work. Still so new to Richmond’s many hidden diamonds, I stepped into Deep Groove with delight and surprise: The modest storefront hid a bite-sized bubble of time, frozen in place with wall-to-wall posters and burning incense. Here was an endless ‘60s summer, a time when radio was king and its knights rode forth on rock and roll. We were greeted with the easy beats of reggae playing at the command of manager Chris Pittman, as the models arranged their outfits. It was the perfect atmosphere to showcase Jill’s jewelry: Hip, organic, celebrating the individualism that seems to define so much of Richmond. In fact, ObscurO boasts certain pieces so unique they are one of a kind--and gone once sold. Our models heralded from Jill’s side venture as a hair stylist at Bombshell Salon: Amanda Davis, nail technician, and Leah Roberts, receptionist. These lovely ladies were both stylish and cool before the camera. Rounding out the cast, Rob Skotis (a bartender and bassist for the group Iron Reagan) joined the women for several exterior scenes and worked the background of interior photos. It was fascinating to watch the photoshoot in progress. Jill was a sudden artist, hands-off until moved by sudden inspiration. Carly, as the main photographer, worked methodically with a clear vision. But they shared between them an equal passion and enthusiasm for the project, and a clear love for the work and the people involved.